A young man has seized the opportunity of the Pope’s presence to ask for his girlfriend’s hand in marriage. Men are now devising more interesting ways of proposing to their girlfriends. 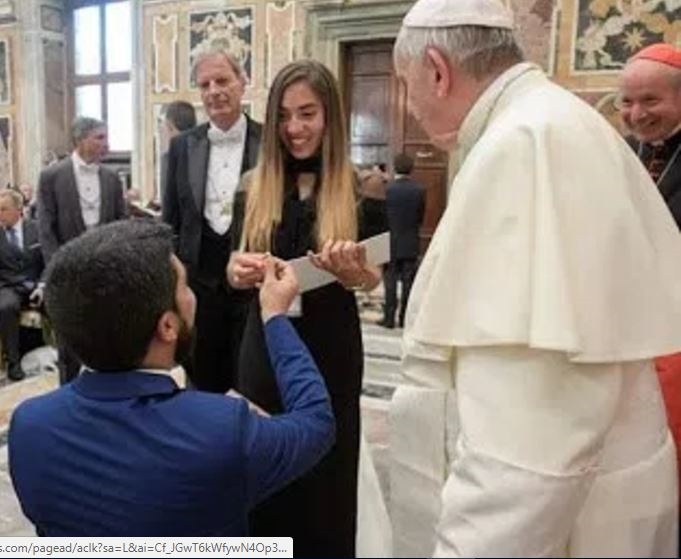 This young man decided to pop the question to his girlfriend right in the presence Pope Francis on Sunday at the Vatican’s Clementine Hall. The Pope was present at the venue to meet with participants of the International Catholic Legislators Network and was conscripted into the background story of the couple’s love life. The pope looked in amazement as the young man knelt down to pop the question. Thankfully, the girl said YES! Love is a beautiful thing one would say!